In a compelling examination of the hermeneutical and epistemological anxieties gripping both the early modern and our current world, Stefania Tutino shows that post-Reformation Catholicism did not simply usher in modernity, but postmodernity as well. This deft study provides new insight into and a fresh perspective on the context of the Protestant Reformation and the Catholic response to it. 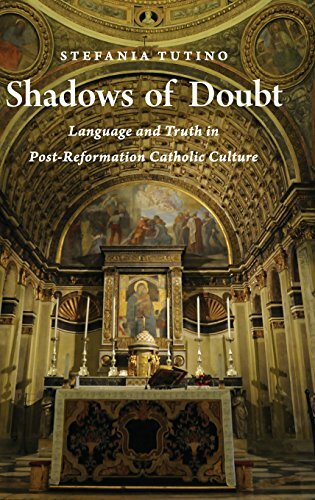 Shadows of Doubt provides a collection of case-studies centered on the relationship between language, the truth of men, and the Truth of theology. Most of these case-studies illuminate little-known figures in the history of early modern Catholicism. While the militant aspects of post-Tridentine Catholicism can be appreciated by studying figures such as Robert Bellarmine or Cesare Baronio, who were the solid pillars of the intellectual and theological structure of the Church of Rome, an understanding of the more fragile and shadowy aspects of early modernity requires an exploration of the demimonde of post-Reformation Catholicism. Tutino examines the thinkers whom few scholars mention and fewer read, demonstrating that post-Reformation Catholicism was not simply a world of solid certainties to be opposed to the Protestant falsehoods, but also a world in which the stable Truth of theology existed alongside and contributed to a number of far less stable truths concerning the world of men. Post-Reformation Catholic culture was not only concerned with articulating and affirming absolute truths, but also with exploring and negotiating the complex links between certainty and uncertainty. By bringing to light this fascinating and hitherto largely unexamined side of post-Tridentine Catholicism, Tutino reveals that post-Reformation Catholic culture was a vibrant laboratory for many of the issues that we face today: it was a world of fractures and fractured truths which we, with a heightened sensitivity to discrepancies and discontinuities, are now well-suited to understand.